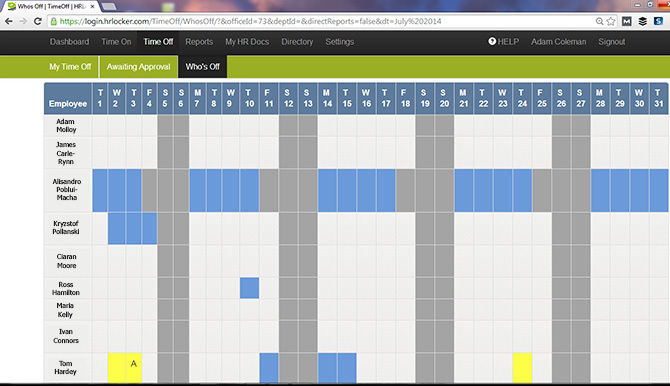 Streamline your annual leave and absence management. Never again will a manager be pestered with this question. Employees simply select the dates they want to take off which sends an email to their manager notifying them of the request. Managers can quickly approve or reject the request. At all times users can see their annual leave allowance, days carried over if appropriate, days taken to date, days booked ahead and their remaining balance. This saves valuable time rather than manually answering these requests via email. HR Locker calculates how much annual leave accrues on a day by day basis for each employee and for the entire company. This allows you to see immediately how many days have been accrued by staff and how many have been taken. It also allows employees or their managers to record sick leave. Reports are useful for quickly identifying any important trends. Because the system is totally configurable administrators can set leave year rules for the entire company or an individual branch office. For example, the standard number of annual leave per employee might be 20 days in the London office and 15 days in the Beijing office. It’s also possible to set whether annual leave can be carried over or not to a specific number of days. You can specify certain days in the year when each office is closed. These days can be set to be deducted from employee’s annual leave or not. This function is frequently used to indicate when a company might be closing at times such as Thanksgiving, Christmas or Golden Week. See accrued annual leave balances for employees, offices and the entire company. Maintain accurate records to comply with employment law requirements. Improve efficiency in your company and reduce admin overheads associated with Excel records and paper based holiday applications.